Welcome to the New Resource Roundup, a series dedicated to highlighting Falvey’s new databases and acquisitions that help make you an excellent researcher, student, and citizen! The Library now subscribes to selected subjects of the Oxford Research Encyclopedia (ORE). ORE offers peer-reviewed introductions to foundational and trending topics written by well-regarded authorities. With this new product Oxford University Press is moving towards a new publication model that is exclusively digital in nature, curated by an editorial board, regularly updated, and continuously growing. ORE offers currently over 20 subjects on the same platform, thus facilitating interdisciplinary discovery. More subjects and subfields will be added over time. Scholars new to a topic will benefit from the well written articles, which offer up-to-date introductions and overviews, guidance on print, digital, and archival primary sources, and bibliographies of the secondary literature. Articles feature tables of contents and links to the Library’s holdings and interlibrary loan form from the bibliography. Each article has its own DOI (digital object identifier), suggested citations in APA, Chicago, and MLA styles as well as export options to various reference managers. Articles can be downloaded as pdf files or saved to a personal account. Presently the Library subscribes to four subjects: American History, Latin American History, Religion, and the Oxford Classical Dictionary. ORE of American History currently encompasses over 250 articles but aims to cover a much wider sweep of American history. Read the introduction by its editor in chief John Butler for more detail. Recently added to ORE of American History was Bart Elmore’s article on “Regulating America’s Natural Environment,” which covers the topic up to the current administration. Elmore, Bart. 2018 “Regulating America’s Natural Environment.” Oxford Research Encyclopedia of American History. 3 Nov. 2018. doi:10.1093/acrefore/9780199329175.001.0001/acrefore-9780199329175-e-530. ORE of Latin American History consists of over 300 articles and is expected to cover the history of all Latin American peoples from prehistory to today eventually. It includes an introductory course syllabus for Latin American history which features a wide variety of audiovisual resources. William H. Beezley, editor in chief, introduces the scope and goals of ORE of Latin American History here. Celeste González de Bustamante’s and Verónica Reyes-Escudero’s article on “Digital Resources: The Documented Border” is a great example of the possibilities offered by a digital publication platform. González de Bustamante, Celeste, and Verónica Reyes-Escudero. 2018 “Digital Resources: The Documented Border.” Oxford Research Encyclopedia of Latin American History. 3 Nov. 2018. doi: 10.1093/acrefore/9780199366439.001.0001/acrefore-9780199366439-e-298. 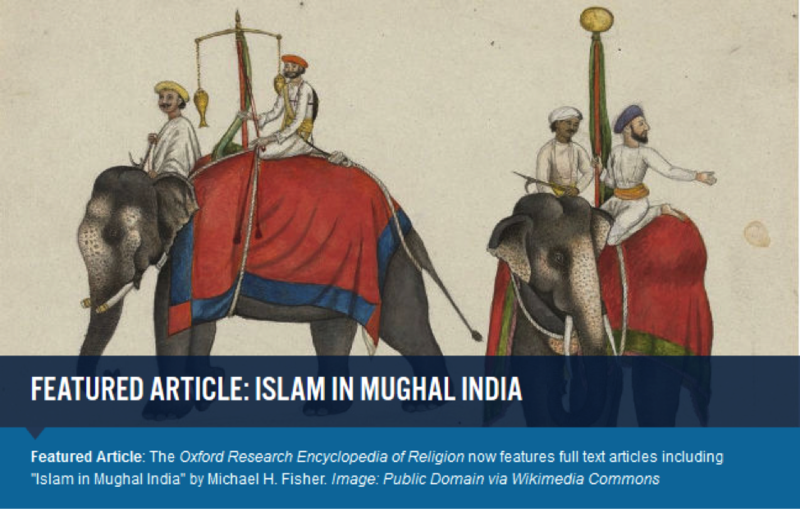 Fisher, Michael H. 2018 “Islam in Mughal India.” Oxford Research Encyclopedia of Religion. 3 Nov. 2018. doi:10.1093/acrefore/9780199340378.001.0001/acrefore-9780199340378-e-648. The Oxford Classical Dictionary (5th ed.) is the first edition that is exclusively published in electronic format. Articles in the fifth edition are considerably longer as those in the previous editions with the constraints of print publications gone. The Dictionary now includes timely updates and links to digital resources. For more information read the introduction by Tim Whitmarsh, editor in chief of the Dictionary. Among the subjects currently under development are African History and Asian History. Already published articles in these subject areas are currently freely available. Gordon, Robert, and Jonatan Kurzwelly. 2018 “Photographs as Sources in African History.” Oxford Research Encyclopedia of African History. 3 Nov. 2018. doi:10.1093/acrefore/9780190277734.001.0001/acrefore-9780190277734-e-250. ORE of Asian History will eventually cover the entire sweep of Asian history. Presently it features barely 100 articles. However, among them are two timely essays: David Brophy’s article on the Uyghurs and Jacques Leider’s article on the Rohingya. For more information read the introduction by David Ludden, editor in chief. Brophy, David. 2018 “The Uyghurs: Making a Nation.” Oxford Research Encyclopedia of Asian History. 3 Nov. 2018. doi:10.1093/acrefore/9780190277727.001.0001/acrefore-9780190277727-e-318. Leider, Jacques. 2018 “Rohingya: The History of a Muslim Identity in Myanmar.” Oxford Research Encyclopedia of Asian History. 3 Nov. 2018. Let us know if you agree with us that ORE is a great new addition to the Falvey collections and if you would like to see other subjects added in the future.